Despite the seemingly endless rain, construction continues on the KVT project. With stream restoration complete, we've made the first production steps along the trail itself, starting with the underground work. New storm water and drainage pipe will be installed throughout the trail. Much like the gas line replacement, storm drain installation is challenging work, particularly with existing storm drains and utility lines running the full length of Klingle Road. The first storm water pipe installation started last week, replacing a failed brick masonry culvert that outfalls into Klingle Creek. Scroll through the slideshow below to see the construction sequence. 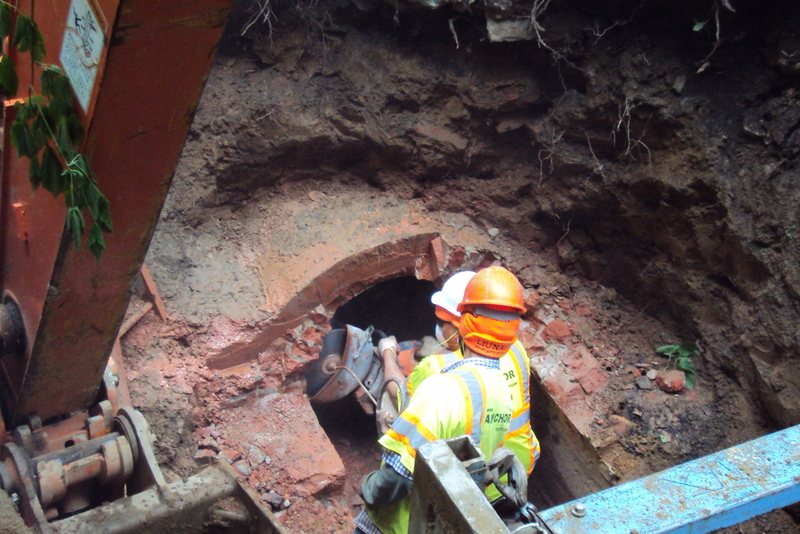 The crew constructs the concrete collar to be placed around the seam between the new and old culvert. Formwork and rebar are installed. Fresh concrete placed for the collar. A crew member vibrates the fresh concrete to ensure that the aggregate in the concrete mix distributes evenly across the collar. Work within the Porter Street Interchange has been a key focus area over the past few weeks. Sidewalk installation along the Klingle Road to Porter Street Connector Ramp took place last week (Stage 2A in the graphic below). Click through the slideshow below to see the sequence of construction along the connector ramp. DDOT tests subgrade compaction with a soil density gauge. Poor or uneven compaction will cause the sidewalk to crack prematurely. Concrete finishers cut the joint pattern into the fresh concrete. The joints reduce cracking by allowing the concrete to expand and contract in hot and cold weather. Over the past few weeks, the KVT contractor has also focused on constructing new wheelchair and bicycle ramps within the interchange, which are installed in accordance with DDOT and Americans with Disabilities Act standards. Washington Gas is also progressing gas main replacement east towards Porter Street. Excavation and pipe replacement is now taking place within the active segment of Klingle Road, as seen in the left photo below.